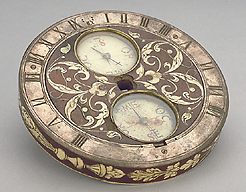 This horizontal dial is part of a miner's survey set. It is a circular block of wood, with ivory insets and the hours engraved on an applied silver ring. The hours are engraved from IIII to XII to VIII, with the XII in smaller figures than the others. Above this numeral are four paired piercing, probably for fixing the instrument to other parts. In the central part of the block are two compasses with the cardinal points abbreviated 'SE', 'OR', 'ME', 'OC' in alternating red and black letters. The rest of the wood block has ivory flower insets, as in the rim. On the bottom part of the wood block is the signature, date and initials 'HANS GRAF ZV GVNDHALBING', '1563', 'IM', 'IAR' in scrollwork. At the centre is a circular well and a square perforation for fixing the part to the rest of the survey set. The instrument was purchased in 1862 and is described in F. A. B. Ward, A Catalogue of European Scientific Instruments in the Department of Medieval and Later Antiquities of the British Museum (London, 1981), p. 22, no.9.